With a diameter of 21mm, shank diameter of 20mm, flute length of 55mm and overall length of 125mm, this end mill is powerful, economic and productive. 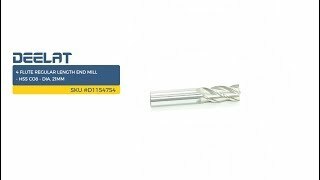 This flute end mill features a high-speed steel and cobalt construction, which makes it an effective and reliable tool for metalwork. The four flute design increases productivity and efficiency. This end mill produces an exceptional finish and provides great accuracy.